Talk about a sleeper. Back in the late eighties Ford was developing a 2 seater sports car. That project was cancelled. Ford needed to use up the V6 engines it had purchased from Yamaha under contract, so they dropped them in the Taurus and created the SHO. This was supposed to be a one year limited run, but in 1989, its introduction year, Ford sold 15,000 SHOs and decided to continue the model. It lasted for 10 years. The Taurus SHO was fast. The Yamaha engine loved to rev and had great mid-range Power. The first generation (1989 - 1991) SHOs are said to hit 60 MPH in 6.6 seconds. Car & Driver named it one of the 10 Best Cars of 1989 and wrote: "The SHO took us to 143 mph on the test track and did it so well that we fell in love with the car." The second generation (like the one shown here) was capable of hitting 60 MPH in under 7.5 seconds, making it quicker than the same year BMW 535i. For the most part a Taurus SHO looks like a standard Taurus. There are some minor trim differences; different side molding, slightly different nose and rear bumper, but for the most part it looks like any other Taurus. Buy a Taurus SHO and most of the world will have no idea what you have or how capable it is. The car listed on Craigslist is out of Springfield, MA. The selling price is $500.00. Most of the parts are stock Taurus and available in most junkyards. The SHO specific parts are a little tougher to get, but available on the internet. This might be the ultimate sleeper. It's a car that's cheap to own and a lot of fun to drive. Click here to see the Craigslist listing for this car. Click here to find the Taurus Car Club of America site. Click here to find the FordMuscle.com article on the Taurus SHO. 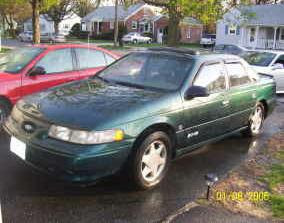 Yes, the SHO Taurus was a cool sleeper, take the badges off and add to the surprise. All the ones my friends had always ate brakes quickly though. I almost seem to remember it was a common problem with the rears especially. Disc brakes all around.